CCMI invites friends of all ages to join in our annual World Oceans Day Celebration on Saturday, 8thJune 2019. 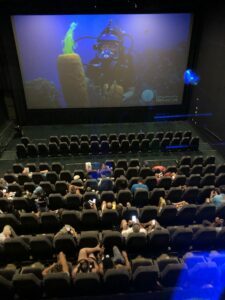 As an important event in our Healthy Reefs efforts this year, we are excited to host a special Reefs Go Live from the Camana Bay Cinema, where we take our audience on a special ‘live dive’ with educators and researchers in Little Cayman. The broadcast will explain exactly ‘Why We Love Healthy Reefs’, and the audience will be taken on a virtual underwater experience in Little Cayman, exploring what makes a coral reef healthy and why a healthy reef is so important. Leave the cinema with some great ideas on how you can help support healthy reefs. This event is free and open to the general public; however, seating is limited so registration is requested. We appreciate the support of our event sponsors and partners who are making this Reefs Go Live broadcast possible.